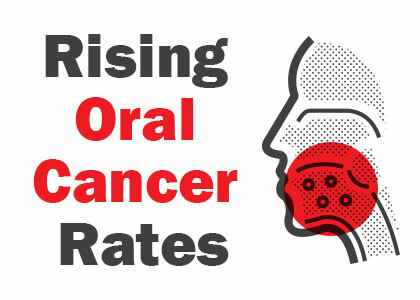 Home › Blog › Rising Oral Cancer Rates – Have You Been Screened? However, Dr. Sevey and Dr. Sigwart of Creative Dental Solutions want to provide Bangor residents with relief by educating you on what to look for and screening you for oral cancer regularly. Read on to learn more and feel free to give us a call with questions and concerns. First, no two mouths will look identical, as evidenced by how people can be identified post-mortem with dental records. While this fact may seem morbid, it illustrates how each smile is unique, which is one of the reasons Dr. Sevey and Dr. Sigwart love being a dentist. A sore (or several) located on your lip, tongue, theroof of your mouth, or gums that does not heal within two weeks. Our doctors and hygienists are well trained to identify symptoms of oral cancer. Our hygienists perform oral cancer screening exams on all our patients. If they find anything that looks suspicious, they bring in one of our doctors to take a look. We document the size, shape, and color of the area in the clinical notes and take intraoral photos. If anything seems suspicious, Dr. Sevey and Dr. Sigwart may remove some cells for biopsy or refer you to an ENT for further evaluation. If the biopsy results are negative, we can breathe a sigh of relief with you. If they happen to be malignant, it’s best that we find out early to double your chance of recovery. ‹ Can Bleeding Gums Cause a Heart Attack?